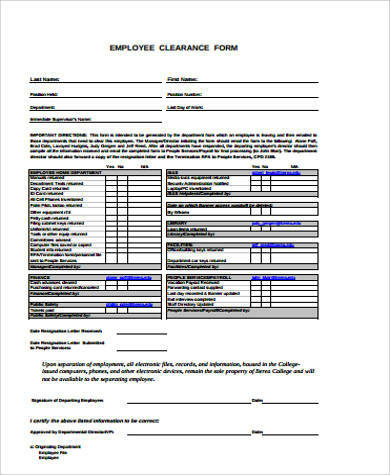 An employee clearance form, or an exit clearance form, is used by a company to assure that a resigning employee is already free from all his/her responsibilities to the business and s/he is already cleared from being connected with the company and its processes.You may also see medical clearance forms. 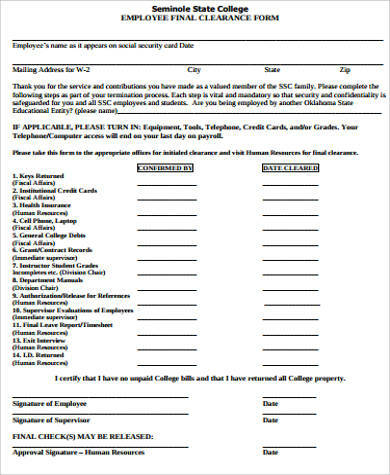 This post includes a list of sample employee clearance forms that you may use as guides in creating the exit clearance form template that your company may give to its resigning employees before their effective date of resignation. More so, we have other kinds of sample forms available for download in the link provided for additional references. 2. The date of the employee clearance form accomplishment. 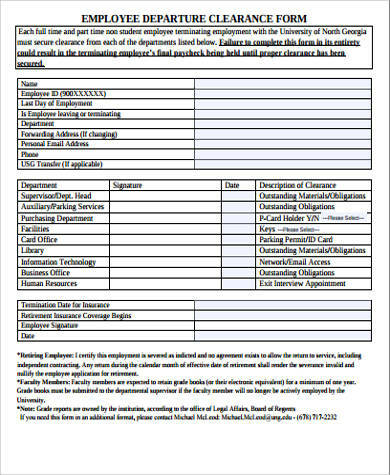 You may also see return to work forms. 8. 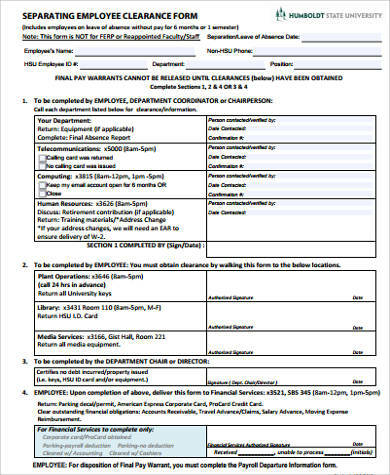 A space dedicated for the signature and remarks of the authorities regarding the status of the resigning employee’s responsibilities to their department.You may also see application forms. 9. The items that the resigning employee needs to fulfill before his/her clearance will be signed. You may also see physical exam forms. 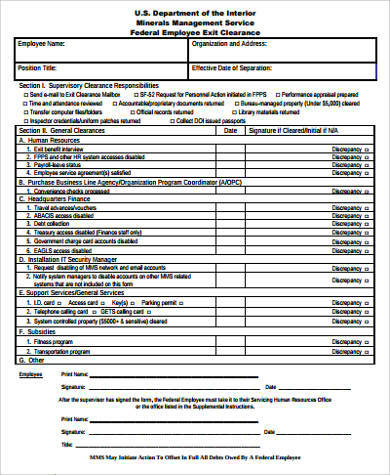 Aside from our samples of employee clearance form templates, you may also be interested to browse through and download our samples of Employee Evaluation Forms and Employee Application Forms. 1. It assures the resigning individual that s/he has already completed all the activities that s/he needs to fulfill so that s/he can already be subjected for formal resignation. 2. 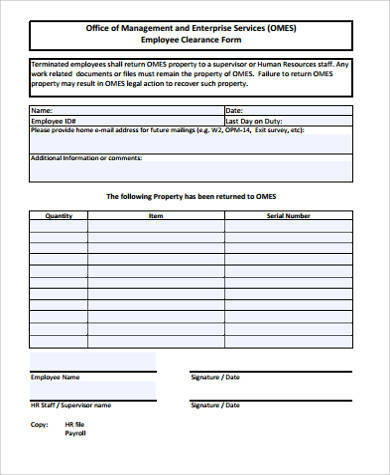 It lists down all the items that are needed to be returned, which makes it easier for the employee to gather all the company properties that have been subjected for his/her care in a limited time duration.You may also see sample request forms. 1. It creates awareness with the dates when the employee has already been cleared in various departments.You may also see printable medical forms. 2. It assures the company that all the items like manuals and other business assets given to the employee, which is intended to be kept during his/her stay, have already been returned.You may also see music release forms. 3. It assures the management that the employee does not have any remaining balances and other obligations to the company.You may also see sports physical forms. 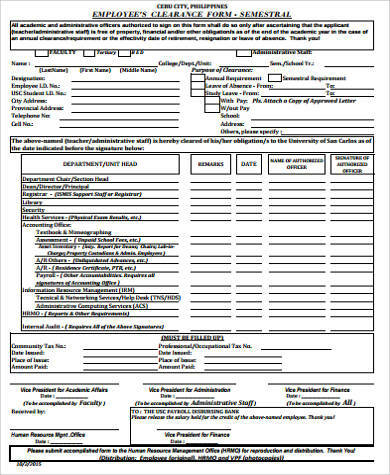 Other than our samples of employee clearance form templates, our samples of Employee Information Forms are also available for you to browse through and download in the link provided.